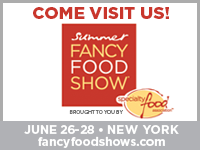 We are thrilled to announce that REACH Organics will be exhibiting in the "New Brands on the Shelf" aisle of the Fancy Food Show at the Javits Center in NYC. This is an incredible opportunity and we are very excited. Please come see us for samples and show specials. Looking forward to see you in the BIG APPLE!